Brent oil prices decreased by 2.76% or US$1.94, as prices fell this week. Oil traded on April 5, 2018 at a price of $68.33 per barrel relative to US$70.27 last week. Brent oil began the year at US$68.07 per barrel. 87 Octane prices decrease week over week, by 0.22% (JMD$0.27). Additionally 90 Octane fell by 0.22% or (JMD$0.27) week over week. 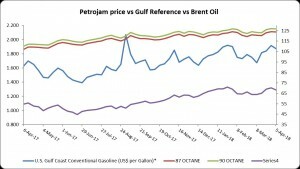 87 Octane and 90 Octane opened the year at J$121.04 and J$123.88 respectively and now trades at J$123.79 and J$126.63 per litre respectively. Companies that are publicly traded as U.S. oil exploration and production (E&P) assess their yearly projected cash flows from their proved reserves based on technology, higher prices and geology. Along with these conditions, with the latest release of proved reserves assessments for 2017, the companies factored in effects related to changes of income tax law for corporations enacted at the end of last year. The implications for the 2017 proved reserves reports include fewer tax liabilities for the companies than under the old tax law, ultimately contributing to the total increase in the future cash flow they expect from proved reserves.